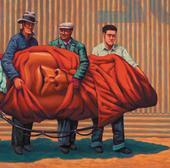 The first single off The Mars Volta’s new album is called “Viscera Eyes.” Stream this 9 minute track on MySpace. A good soundtrack for any tractor-trailer who might be carrying 43 thousand pounds of hogs. Win a signed, limited-edition poster that Ben Tegel of The Vacation created (see above), plus the new CD. Just be the first to email usounds@gmail.com with “The Vacation” in the subject line. Also, it’s okay if you mention Gnarles Barkley somewhere too since that’s such a hot scene right now. Rogue Wave and Nada Surf are going on tour together… match made in heaven but still we can’t think of any really clever way to mash up their names, maybe you can help? Jena Paradies is the nom de deck of Cornel Novac, who lives in Atlanta by way of Berlin and Moldova. His experimental techno has Teutonic coollness, American invention, and Moldovan… flavor. In any case, it’s good.